I have many interests, so this is going to be a blog on lots of subjects. Submarines, my family, history, books I read, the space programme, archaeology, astronomy, current events, the occasional joke.... Just don't expect any politics, sports or deep philosophy, and we should get along fine. One of the last British soldiers to serve during the First World War has died, less than a week before he would have marked the 90th anniversary of the Armistice. Sydney Lucas, who joined the Sherwood Foresters regiment just three months before the end of the conflict in 1918, passed away at the age of 108 in Rosebud, near Melbourne, Australia, where he lived most of his life, on Tuesday. His death leaves the number of known British veterans of the Great War at four, including one man who also lives in Australia. The three surviving veterans still living in Britain - Henry Allingham, 112, Harry Patch, 110 and Bill Stone, 108, - are expected to lead a two minute silence at the Cenotaph on London at 11am on Tuesday, Nov 11 - exactly 90 years after the moment in which the Armistice between Germany and the allies was signed ending four years of carnage. The fourth surviving British veteran is Claude Choules, 107, who also lives in Australia. Originally from Leicester, he was conscripted into the British Army's 54th Sherwood Foresters while a teenager in August, 1918, but the war ended before he was sent to fight. Mr Lucas migrated with his wife, Winifred, to Australia in 1928 and enlisted in the 2/1st Machine Gun Battalion soon after the outbreak of World War II. This time, an attack of appendicitis and an operation on his gall bladder on arrival in Palestine meant he could not continue with his mates to their landing in Crete. At the age of 41, he was transferred to prisoner-of-war duties and guarded Italian and German prisoners being shipped to Australia on the Queen Mary. "They reckoned I was not fit enough, so they brought me home. I was never in any fighting, but it wasn't my fault I wasn't," Mr Lucas said. 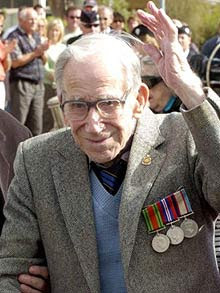 According to Wikipedia, Lucas was the 13th WWI veteran to die this year - a list which includes the last surviving Italian, German, Austrian, Turkish, Polish and female veterans. Their list of surviving WWI veterans now lists ten men: five British, two French, and one each Australian, Canadian and US. Retired sailor with 21+ years of service - including 13 years on 688-class submarines, and three on a sub tender. Born and raised in the Midwest, now living on the East Coast. Endeavour (STS-126) to launch today.